Like many industries, the used car marketplace continues to evolve at an unprecedented pace, thanks to an explosion of car buying technologies, services and marketing platforms that drive consumer behavior. Strategies that worked years - or even months - ago may no longer be relevant, resulting in many dealers feeling that they are in a perpetual state of "catch up" as it relates to the most effective approaches to used car inventory, pricing, marketing and merchandising. With that in mind, we are highlighting four key steps that DealersLink members can implement to stay current and increase their inventory turn, sales and profitability. Dealerslink members can implement these steps to stay current and increase their inventory and turn as well as sales and profitability. Dealerslink members have the ability to efficiently balance inventory through our industry-leading Dealership Analytics. Our Stocking Report analyzes the sales history of both your store and your local market to generate an ideal inventory unit mix report. You'll have the confidence of knowing which type of vehicles to add to your inventory to meet your sales goals, and which type you should unload. Our Velocity Report identifies the vehicles with the highest potential in your local market. 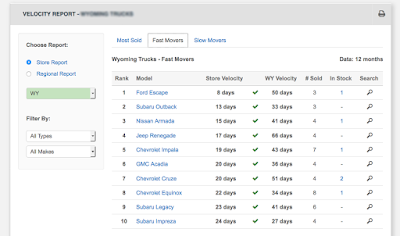 Knowing which vehicles are likely to be fast vs. slow movers will lead to more informed inventory decisions. 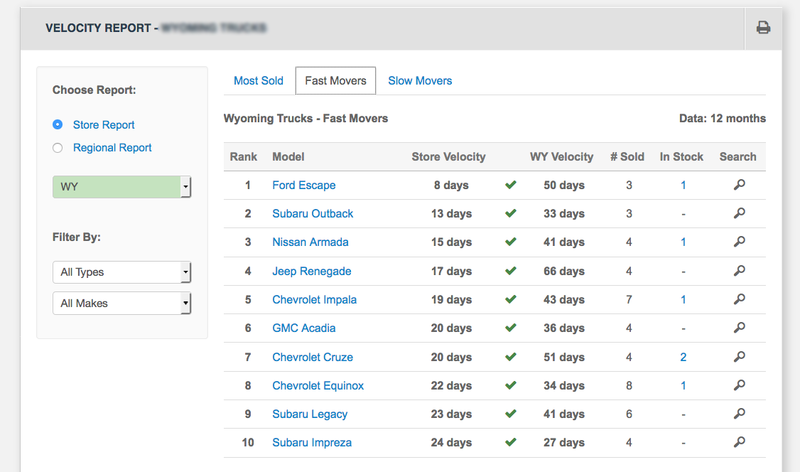 These analytics, coupled with buying your inventory on our marketplace, ensure that you'll fill your inventory with retail-ready vehicles without paying fees and on the backend. You also won't pay sell or transport fees, leaving you room for a far higher gross per unit. An informed pricing strategy - one that is based on real-time data from your local market and not speculation - will increase turn and profit. Our Retail Pricing Tool allows you to see the age and velocity of each vehicle, and instantly see the "sweet spot" for any unit. In turn, you're able to price in-demand vehicles higher and slower-moving units more aggressively. This insight will lead to appropriate pricing for all vehicles, utilizing the structure laid out in the infographic above, all while increasing traffic to your showroom and ultimately, maximizing gross profit. 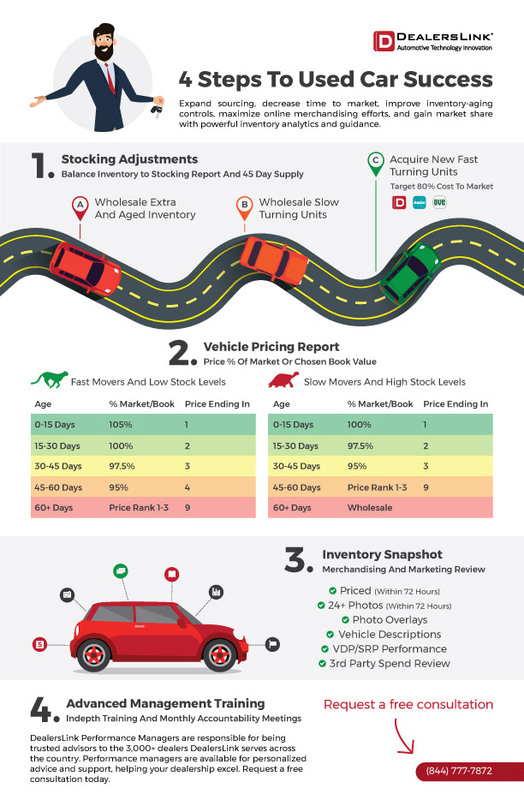 Following some straightforward guidelines for the merchandising and marketing of each vehicle in your inventory is critical to used car success. Our Inventory Snapshot tool leaves no room for error. You'll always know which vehicles are missing pricing details, photos, descriptions or included options. Furthermore, you'll always know exactly when and where your inventory is being marketed online. "If it's not listed, it's not for sale." All vehicles should be priced and have photos posted within 72 hours. Photo Count and Quality: In an earlier blog post series, we discussed how photos often create the first impression of your dealership in an environment in which you have you have mere seconds to get a customer's attention. Each unit should have a minimum of 24 photos and follow the guidelines laid out in this blog series. Branded Overlays: When marketing individual vehicles on 3rd party sites, it's important to brand your dealership, as well. Our ExportPro tool turns the previous arduous process of adding custom text and a dealership-branded overlay for individual photos into a seamless processenabling you to upload hundreds of branded photos at once. Accurate Descriptions: Posting inaccurate vehicle listings will lead to consumer frustration and risk negatively impacting your brand. ExportPro helps generate a complete and accurate description for each vehicle added to your inventory. 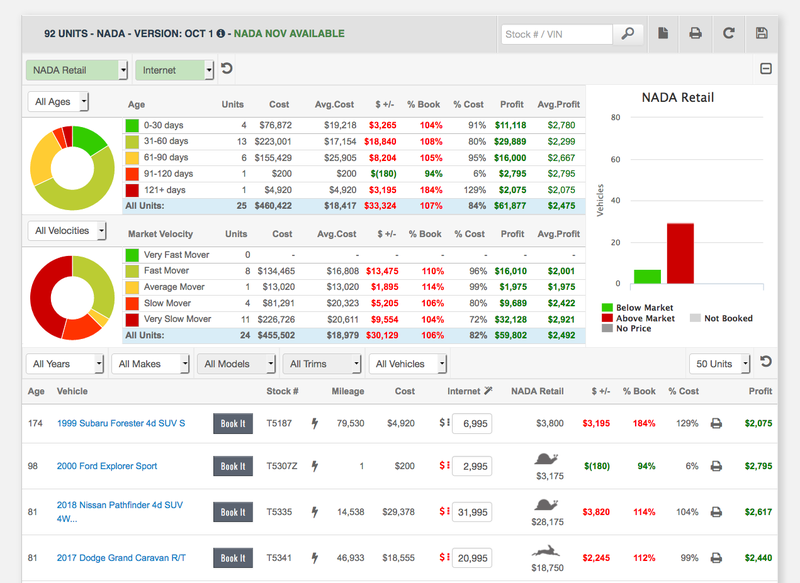 Analyze VDP/SRP Performance: Using analytics from dealership and 3rd party websites, dealers can monitor the activity on any given unit in their inventory. 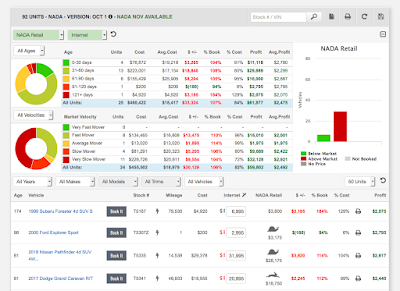 If a car has been in stock for 30 days with no clicks, it is time to make an adjustment on the units to get some more views. Our performance managers can help you analyze this data to help make the most informed decisions on merchandising your vehicles. 3rd Party Marketing Spend Review: Digital marketing should not be a "set it and forget it" exercise. Reviewing your spend - and ROI - with all third party sites should be a regular and ongoing process. The fourth and final step to used car success available to Dealerslink members is signing up for our Advanced Management Training. This exclusive program focuses on education and accountability with our experienced industry leaders who truly understand the path to success. Advanced Management Training will hone in on needs within your business, allowing you to set measurable goals, identify barriers to success, and arrive at a vision for success that is specific to your dealership. To learn more, you can request a free consultation here.